Can this library be used in any Java project or just Android? I see multiple branches here and no documentation on which branch is to start with. Which branch should I use to start with? How do you integrate this library in your own project? What approach is better: Make Volley as a standalone library project and spin a jar and put it in your project or copy the all source code inside your project? $ android update project -p .
Then, copy bin/volley.jar into your libs/ folder and off you go! In the Volley lesson, Google instructs as to either add Volley to our project as an Android Library project or as a .jar file. In both cases I suggest renaming the .jar file to the date of Volley's latest commit, i.e. volley_20150319.jar, to keep versioning simple. Clone the Volley repository via Git. Build the project. (I had to change the gradle build settings to reflect the latest build tools and gradle version, but it's usually up to date). In both the debug and release folders you'll find a JAR file called classes.jar. Copy either JAR file into your libs/ folder. Gradle sync, and you're done. Select Java / JAR file. We're only interested in the src folder and nothing else. The easiest way to make sure only it is selected is to deselect the project and then select the src folder inside. Check the Export generated class files and resources option. OPTIONAL: If you want the Javadoc to be visible also select the Export Java source files resources. Create the JAR file and put it in your libs/ folder. It is for Android only, as it depends on Android-specific classes. You can tell this by looking at the source code, for stuff like RequestQueue. 2) I see multiple branches here and no documentation on which branch is to start with. Which branch should I use to start with? The instructions from the Google I|O presentation were to just clone the git repo, which would pull from the master branch by default. 3) How to integrate this library in your own project? What approach is better: Make Volley as a standalone library project and spin a jar and put it in your project or Copy the all source code inside your project? The instructions from the Google I|O presentation were to add the source code to your project. Personally, I find this to be a bizarre approach. If you're using Gradle, you can import Volley from here. This is an unofficial mirror (with some minor bugfix, see Changelog for details.) for android volley library, the source code will synchronize periodically with the official volley repository. Since there are many answers about a single approach, but none that is comparing the different ways to get volley up and running, I also put my two cents in. Feel free to edit/enhance this answer as well. The files show up immediately in Android Studio. For Eclipse you will have to right-click on the src folder and press refresh (or F5) first. Doing it via git is what is officially suggested in the android tutorials (look here). The main "advantage" here is, that this will keep the version up to date for you, whereas in the other two cases you would have to manually update volley. On the "downside" it is not officially from google, but a third party weekly mirror. But both of these points, are really relative to what you would need/want. Also if you don't want updates, just put the desired version there instead e.g. compile 'com.mcxiaoke.volley:library:1.0.7'. You can extend the main Volley class in your own project for modification, which keeps you from having to mess with coding your changes every time the Volley framework is updated. Here is a small Quickstart for a Volley Http Request, It is extremely easy to integrate. You could put it in your Application class and make it statically available via getRequestQueue(). Then you can already use the RequestQueue.add() method to execute the first request with Volley. Use JsonObjectRequest to query for a single object, use JsonArrayRequest to query for a list of objects. after you add volley as library you can start using it in your application. and at last put the request in queue. i.e. Also I would suggest you to make a Singleton of RequestQuery. ... everything is now set up. That might not appear to be so because the default Project Structure view (File -> Project Structure) doesn't show the libs directory. To see it, you need to use the spinner just above the Project Structure view to change Android to Project. You'll see that Android Studio prompts you with the completion RequestQueue (com.android.volley). Its also pretty easy to get a debug aar built if thats your preference. Then make a new Android studio project (just a regular app project) in a different directory. Once thats complete, add a new submodule (File | New Module). Choose the import existing project option and point it to the directory where you checked out volley. Once thats done you can make your module and it will create an aar file. cut (copy & delete) the folder COM under the JAVA folder to below the SRC folder like in regular Android project. change the project.properties target to 15 instead of 8.
export the project as jar file including the source - use the export tool. keep in the exported jar only the COM folder and the META-INF folder, delete all the others folders - use zip tool to delete the content of the jar. use this jar as your Volley jar project. put the Volley jar in the lib folder of your destination Android project. If you want to use the GET method you should have something like that. But if you want to post data in the server,then you should construct a HashMap and Volley library converts those key/pair values into JSON objects before posting them in the server. Here is an example. 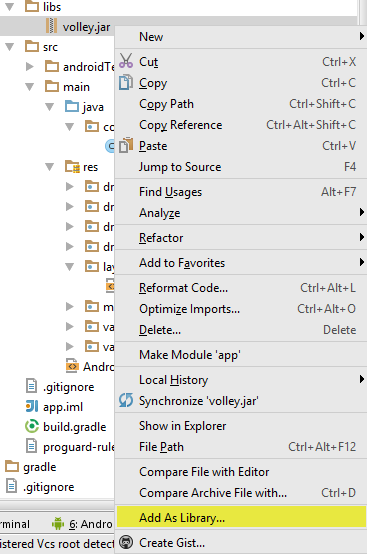 I cloned the Volley project and added configuration files which allow building the library with Gradle. With this you can install the library into your local Maven repository and reference it from an Android project via Gradle. Please bear in mind that there are various clones out there which have improvements for the library. It might be necessary to integrate them and compile your private enhanced version of the library. In addition to the library itself the build script generates JavaDoc and sources archives. I faced a problem when support library was listed on the second line. Reordering these two statements worked for me. Volley can be added as a git submodule in your current project repo. This git submodule will point to the official git repo of Volley. Hence you can get updates from official git repo just by updating the submodule pointer. Further more if you add Volley as a Library Module in your main project you can easily customise it. It will very useful for debugging purpose as well. That would be all! Volley has been successfully added in the project. I love to work with Volley. To save development time i tried to write small handy library Gloxey Netwok Manager to setup Volley with my project. It includes JSON parser and different other methods that helps to check network availability. Library provides ConnectionManager.class in which different methods for Volley String and Volley JSON requests are available. You can make requests of GET, PUT, POST, DELETE with or without header. You can read full documentation here. Just put this line in your gradle file. Not the answer you're looking for? Browse other questions tagged android http android-networking android-volley or ask your own question. How to make a .jar out of the Volley project? Why am I keep getting NetworkOnMainThreadException?